“That’s one small step for a man, one giant leap for mankind.” After speaking these historic words at 10:56 EDT on July 20, 1969, marking the moment that humanity first placed a foot on a world other than its own, Apollo 11 commander Neil Armstrong began his work documenting the lunar surface before him. The image above is the first photo taken by Armstrong after exiting Eagle, the landing module — and the first photograph ever taken by a person standing on the surface of another world. After this image, Armstrong took several more images of the surrounding landscape before fellow astronaut Edwin “Buzz” Aldrin, Jr. exited the module as well. The third man on the mission, Michael Collins, remained in lunar orbit piloting the command module Columbia. Armstrong, as were all the Apollo mission astronauts, was trained in the use of a modified Hasselblad 500 EL camera, which took wonderfully detailed images on large-format film. Most of the photos they brought back have been high-quality scanned by Kipp Teague and are available online at the Apollo Image Gallery. Images: NASA. Scans by Kipp Teague. Thanks for the reminder of this day. Well alrighty then… there’s got to be a space buff out there who actually knows what was in that bag? I thought I’d seen most or all of the images from that mission.. yet don’t recall seeing this one. I suppose there was no one around to give a ticket for littering? I think the bag held sample collection tools, but I am nowhere near certain on that. IIRC Neil tossed it out the hatch first. Jason, turns out the duffle bag contained trash (“arm rest and OPS pallets” according to a NASA tech debriefing report). 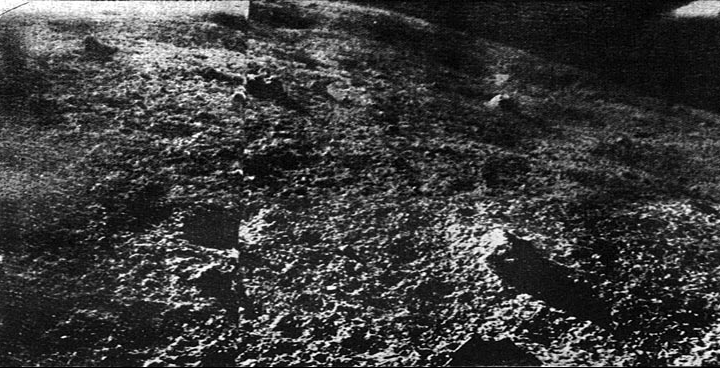 Here’s the true first photo from the Moon, taken by the Soviet Luna 9 lander. Seeing that image appear on the screens must have been just as incredible back then as seeing men land there 3 years later. True… but that up there was the first photo taken by a guy with a camera (a nice camera, no less.) The film shots are simply stunning. Yes that shot has stunning detail.. For artistic reach nothing beats chemical emulsion with its infinite resolution (no pixels to get in the way) and the limiting factor on effective resolution being the (glass) optics. For some applications “your old stuff if better than your new stuff”… having said that nothing beats ccd for scientific applications like deep field, long exposure astrophotography and analysing light curve profiles in exoplanet huntinh..
sorry ipad glitching.. heres the rest: …exoplanet hunting where precise measurement of photons received is necessary..
All in all with all our problems on earth we (humans) are still an amazing race and i still am optimistic we are advancing and improving… Americans can be proud of the enlightenment the moon landings, its space tech and internet have gifted humankind with. Actually I’m not against Amerocentrism. You have to have pride and serve the best interests in the country where you are born — a cohesion that holds the population together. What I am really against is stupid narrow-minded Americans that think the rest of the world (or the universe) is second to them or that they believe they are the only people on the planet. Such people as these are not ‘Amerocentric’ they are more like feeble-minded jingoistic xenophobes. Really. Some 380-odd million Americans verses the rest of the 6,620-odd million that occupy the planet kinda puts it in perspective. Being just 5.7% of the world’s population clearly means a smallish minority. Champions of democracy, Ha! Well the real point is clear, if it were put to a vote, you Americans wouldn’t last ten minutes! ..oh it wasn’t any second, it was 14 hours. Just saying. I think the more apt term is American Exceptionalism – the idea that America – and by inclusion Americans – holds a special place in the world (not necessarily a superior one). Conservatives have distorted the original interpretation to add”… and therefore should not be subject to the constraints that are placed on others”. Amused at the negative ticks here. squidgeny stated a point, and I’m just explaining myself. “That’s one small step for a man, one giant leap for mankind.” Read up on your history. I can’t believe people still make that mistake. Come on. I always debate with myself on putting the “a” in there… I know Armstrong intended it, but it didn’t come across as him saying it, and you can’t really “say” an intended word…ah heck. I’ll add it back in. Of course, if you are going to add something that was not in the original quote, you should enclose it within square brackets. That’s why I don’t often include it. I hate square brackets. In this instance, I don’t think Mr. Armstrong will mind. Neil Armstrong said, “That’s one small step for a mand, one giant leap for mankind'” but, due to a radio transmission hiccup we all here on Earth didn’t hear it. Nope: absolutely no “a” in the audio. Despite what historians and the man himself claim was was intended, surely we are obliged to go with the original unadulterated evidence. “It is one of the most famous phrases in history – and now experts have proven that Neil Armstrong got it wrong. dropped the ‘a’, instead uttering the immortal: ‘One small step for man. On returning home after the Moon landing, Armstrong claimed he thought he had uttered the ‘a’ in the sentence. Researchers claimed perhaps the ‘a’ was lost in transmission, or that it simply could not be heard because of his Ohio accent. The long-running debate has finally been settled, however: and it has proved Armstrong wrong. utter the sound during the Moon landing. Again: definitely no “a” between “for” and “man”. THAT is history, Benjamin, as it happened, not as it was intended. No mistake.